I've talked before about how I got my daughters started cooking dinner once a week. When it comes up every now and then in conversation, the first question I usually get (after the initial look of shock) is, "What do they make?". Of course every child will have different levels of experience, fine motor skill, attention span, interest, etc, but I thought I would share some of the meals my daughters often cook (and have been cooking since around the age of 4). 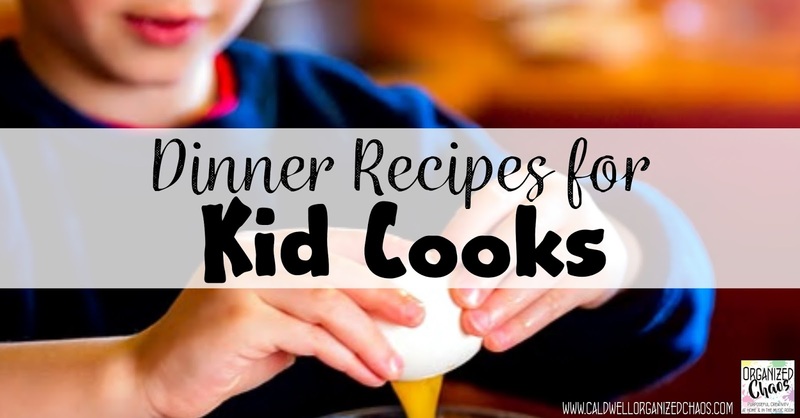 If you're looking for some ways to get your kids involved in the kitchen, these meals are a great place to start! Tacos are great because you can put almost anything in them, and the ingredients are easy to prepare. The girls put each ingredient in its own bowl and set everything out on the table so each person can make their own tacos. Add some tortillas and dinner is served! The girls love making sandwiches to order- peanut butter and jelly, tuna salad, and ham and cheese are usually the choices, and they are easy for the girls to put together (once I open the can of tuna for them). They've recently started making grilled cheese as well! Usually the sandwiches are accompanied with some fruit and maybe a cooked vegetable too. This recipe for baked meatballs is easy to put together- it's basically just meat, eggs, breadcrumbs, and seasoning. They love rolling the mixture into balls, and although they do need help getting them in and out of the oven, they can do the rest of the preparation themselves. These are usually served with dipping sauces (ketchup, bbq sauce, etc) and some sides. Want more ideas? Come join the family! Sign up here for the Organized Chaos Newsletter and get ideas and resources for home and school sent straight to your inbox.